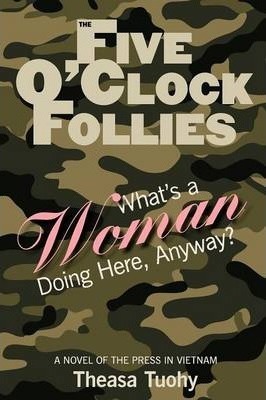 The Five O'Clock Follies : What's a Woman Doing Here, Anyway? In her brilliant debut novel, longtime daily journalist Theasa Tuohy captures the essence of what drives those who go into war armed only with a camera, notebook, and pen. In the fast pace of explosive romance and gritty adventure, The Five O'Clock Follies explores the serious issues of the Vietnam War, the role of the press and what a long way female correspondents have come in forty years. At a time when women rarely dreamed beyond careers as nurses, teachers or secretaries and certainly not as news reporters, a tall, enigmatic redhead arrives in Saigon. She is an object of great interest to the male correspondents, one of whom reports she arrived at Tan Son Nhut Airport wearing "high heeled bikini shoes." Few take her seriously as a reporter. To most, she is a trifle, a bobble, a lagniappe. Angela Martinelli survives a chopper crash, spends several days in the bunkers of the so-called Alamo Hilton during the siege of Khe Sanh, is captured briefly by the Viet Cong while trying to make her own way to the battle of Hue after being refused a hop on a military chopper because she isn't male, and finally is badly wounded when a jeepload of other correspondents are killed in Cholon, the Chinese quarter of Saigon. Her life, loves and struggle to prove herself chronicle the deterioration of the war, the strategic battles around the Tet offensive, and the conflict raging back home over the conduct of the war. Not since Graham Greene has anyone captured so well the tedium and terror of reporting on war. "The action is riveting and the writing is clear, detailed and highly readable. An engrossing portrait of a woman among men in wartime." Kirkus Theasa Tuohy has worked for five daily newspapers and the Associated Press. She is co-book author of Scandalous: The Musical, an award winning show about the life of DH Lawrence, and has written a memoir about renovating her home in France. She is currently working on a mystery set in Paris. She lives in Manhattan.